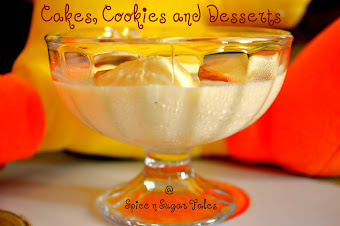 I guess I was too busy baking and making desserts these days, and my blog and space is herded with sugar-loaded recipes, also because of the dulcet desserts event that I recently had and now for sure it calls for a break. After tons of calories jamming up, there is a need for something which is nutrient-rich and calorie-less. Facing back, I see spinach lost somewhere is my recent posts except for the Firangi Kebabs, and this is what possibly buttons me to take up a spinach recipe for this course. This is a recipe by my mom, and she generally makes it with 'Makki Ki Roti'. I can never ever dream of reaching those unbeatable flavors that she imbibes in, but this definitely is a memory refresher for me. Spinach is a member of the goose-foot family, making it a close relation to beets and chard. Cooked or raw? Both have their advantages. Whereas cooking reduces Vitamin C and folate levels, it simultaneously boosts beta-carotein and lutein bioavailability. A sensible idea is to have it both ways. Have spinach raw in your lunch salads and cooked in your evening dinner, for example. Some varieties of spinach are rarely eaten raw, though baby spinach is common in salads. If cooked, it is best lightly steamed to preserve nutrients as much as possible. It is a myth nowadays to believe that spinach has rich iron content. A second analysis of the green vegetable in the lab revealed that there was a minor decimal error in recording the readings. However, one need not worry about the fact that spinach does not have iron content. In fact, spinach has much more invaluable nutrients that help in block such substances such as bioflavonoids and antioxidants that might lead to cancer if not arrested in the early stages. 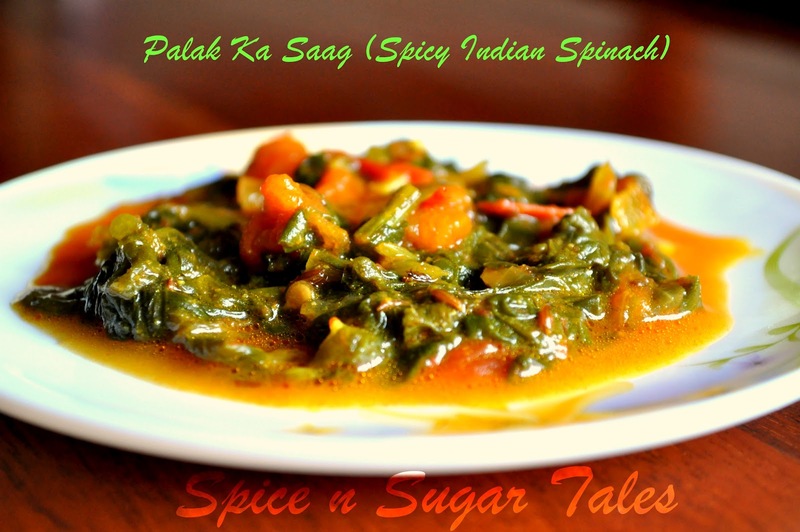 Chop the spinach/palak and wash it well with running water. Chop the onion, tomato, garlic and green chilly. Heat oil in a pan and once hot, add in cumin seeds followed by asafoetida/heeng. Throw in onion and fry till light brown on medium fame. Add the chopped garlic and green chilly and fry for a minute. Splash in the spices and cook for 2 minutes till the oil separates. Add the chopped tomato and cook for 3 minutes till it goes mushy. Keep the flame on medium/low. Now pull in the chopped spinach/palak and give a stir. Add the salt, mix and cover for 5 minutes on low flame. Stir twice in between for proper mixing and see that it doesn't burn. Once the palak/spinach is soft, cook uncovered for 5 more minutes to dry off excess water/moisture. There's no need to blanch the spinach before cooking. 2 tbs besan/gram flour can also be added if you want the gravy to be slightly thick. Garam Masals is always an option, but I usually don't prefer it. Looks yum. Nice clicks. 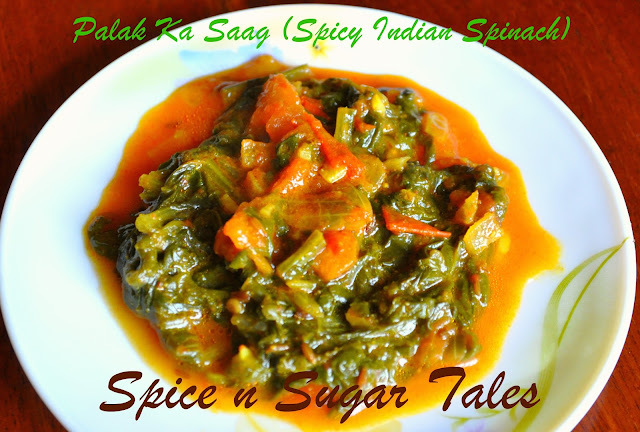 I have posted sarson ka saag. My all time favorite veggie. Looks yummy. Healthy creation...have to try this recipe for sure. I love this simple but delicious curry, awesome.. 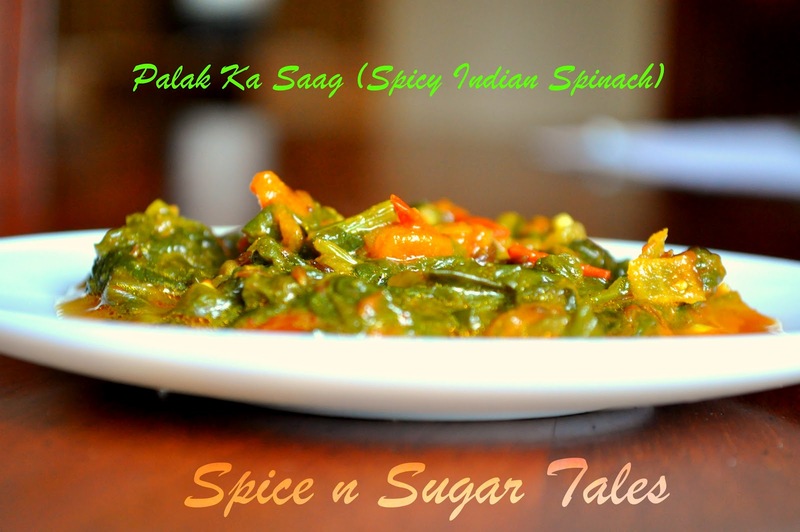 Very healthy n delicious saag,I love this! Palak ka saag and steaming white rice with a teaspoon of ghee screams mums food for me. Too Bad I gave up on the ghee and even white rice.. I will make some tonight just to curb the craving. Love spinach saag but only thing is I hate having to clean the greens. delicious clicks Ya and thank you so much for remembering to send them my way. Hugs to you. Just found your space with lovely recipe collections and seems spicy spinach is great. Do drop at my space, I would love to see you. Hi Anjali!!! I have left 3 awards for you. Please collect them at my blog. Simply mouthwatering... I love palak. Quiet yummy and tasty !! Thanks for linking to the event ! !